Becoming successful entrepreneur from employee is not easy job. You need good business idea and lot of money for investment. It is always advisable to do job before starting business. Why you should do Job before starting your First Business? Take up a job in the field where you want to start your business. Start learning important skills required to start business. Work to learn, not to earn. Important skill for starting own business is communication skills, leadership skills, sales, Team building, Negotiation, Tax laws, business tactics etc. Try to grab knowledge as much as you can. Once you are acquainted with business knowledge it is time to start part-time business keeping your day time job as it is. Biggest mistake people make is they work very hard for earning money. In order to earn more money they take part-time job. If you really want to go ahead in life you keep your day time job and start part-time business. You will find majority of big business in world were started part-time. 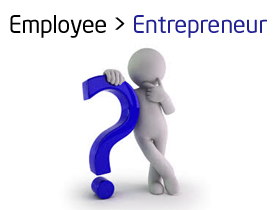 As you know it is very good to become entrepreneur than why every employee is not becoming entrepreneur, few pointers in this direction are given below. First thing which is required to become entrepreneur from employee is vision or dream. You should be clear about what you want to do in life. It also demands strong mindset, as quitting steady job and entering in to field of uncertainty is not easy. Only few employees can make it. Another thing which stop employee from entrepreneur call is steady income. Human mentality sees steady income if it is coming day by day from Job, why to start business. Fear of Failure and Job Security is another aspect which employee thinks before taking further steps towards business. First success example which I would like to give is of Shri.Dhirubhai Ambani, who inspired us even today. Dhirubhai Ambani was one man army he built “Reliance” single largest private sector company of India. Dhirubhai Ambani was petrol pump attendant, but he had a dream to build largest petro chemical refinery in India & he succeed in turning it in to reality. Another success example is N.Narayan Murthy founder of Infosys. Infosys is most admired IT Company it was built by seven promoters with no political background or family wealth. Before starting Infosys, Murthy worked with Patni Computer system and in IIM Ahmedabad as chief system programmer. Nandan Nilekani is another example. He was cofounder of Infosys. He was working with Patni Computer systems. His family and friends opposed him a lot when he decided to give up job for business. In our billion people country India, such examples are very rare. I hope few of you will be inspired after reading this article and will take employee to entrepreneur call.